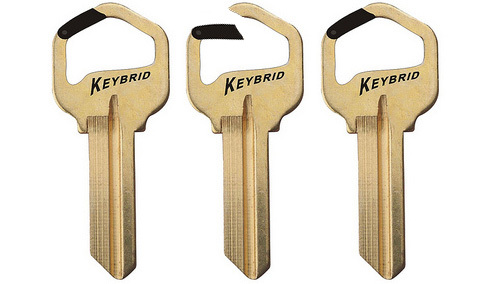 Carabiner Keys = Genius! | OhGizmo! By Andrew Liszewski on 07/19/11 • Leave a comment! When you’re lacking long fingernails, getting a key onto a keyring can be one of the most difficult tasks life throws at you. But thanks to Scott Amron, we no longer have to settle for a pocket full of loose keys. His new Carabiner Key design features a pivoting latch, not unlike the one used on real carabiners, that makes it ridiculously easy to clip a key anywhere. Particularly a keyring. When it’s available this Fall it will be sold as a standard key-shaped blank, meaning any locksmith or machine can easily cut it with their existing equipment. And given Scott’s previous key invention, the Keybrid, sells for about $9 these days, you can probably expect a similar price tag for the Carabiner model.